SMC is a super-rich moisturiser that absorbs immediately into the skin providing instant relief to dry, dehydrated skin with ageing concerns. 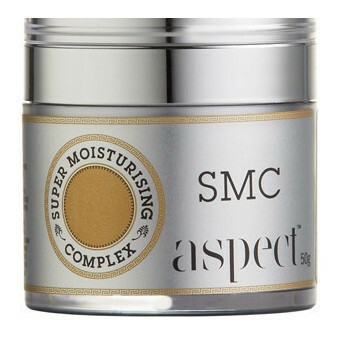 Aspect smc moisturising complex provides barrier function support and also protects against free radical damage. aloe barbadensis leaf extract, glycerin, caprylic/capric triglyceride, cetearyl alcohol stearic acid, cetyl alcohol, ceteareth 20, propanediol, palmitoyl tripeptide-38, glycosaminoglycans, soluble collagen, biosaccharide gum-1, malus domestica fruit cell culture extract, argania spinosa sprout cell culture extract, anogeissus leiocarpus extract, camellia sinensis (green tea) leaf extract, epilobium angustifolium flower/leaf/stem extract, cucumis sativus (cucumber) fruit extract, vitis vinifera (grape) seed extract, echinacea, angustifolia extract, hippophae rhamnoides (seabuckthorn) oil, tocopheryl acetate, retinyl palmitate, tetrahexyldecyl ascorbate, lecithin, sodium pca, sorbitol, squalene, xanthan gum, isomalt, phospholipids, sodium benzoate, hydroxypropyl cyclodextrin, ubiquinone, carbomer, citrus grandis (grapefruit) peel oil, citrus aurantium dulcis (orange) peel oil, phenoxyethanol, ethylhexylglycerin, sodium hydroxide.